We, my wife Martina and I, Bénédict, opened our little Bar called Rhinoçéros in mid of November 2017 in Prenzlauer Berg, Berlin. After becoming totally hooked by stories of our Dj and musician friends that were coming back from Japan, we opened Rhinoçéros, a place dedicated to music and the perfect sound. Our concept is driven by the Japanese Jazz Kissa – and Bar – Culture ジャズバー , small joints serving coffee and whisky, while elderly hosts are playing jazz records on a vintage hi-fi. Jazz and what comes with it, like Soul and Funk. 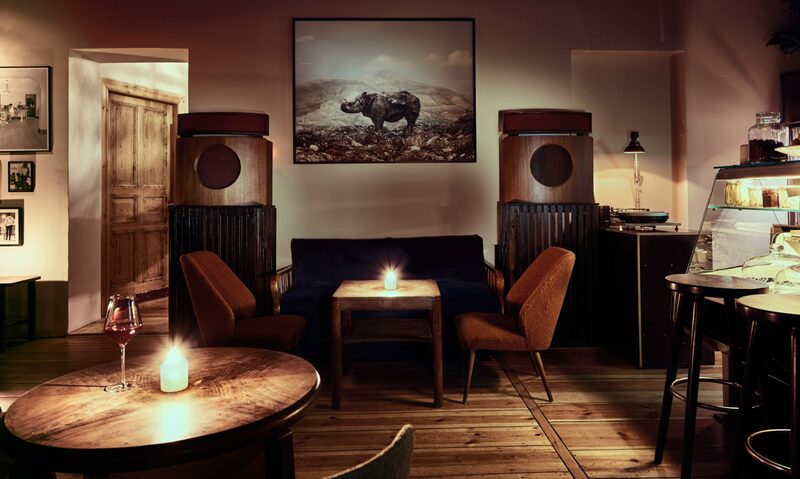 The concept is easy: the heart of the Bar are two beautiful wooden Bowers&Wilkins Speakers from 1976, one round Micro-Seiki Turntable from ’81 and a Quad Amp & Preamp, from the early seventies. We play records from our own collection, or we have guest selectors. No DJ’s as such, as we always play A – and B-Side of the record. Our guests can also bring their own records, to play them on our very warm sounding and super balanced system. At least once a month, we’re hosting music events, like No Room For Squares, dedicated to genre defining records, record releases session (like the Mingus for Strata/BBE, Jazzanova, etc), an evening called Diskospektrum, where everyone can bring their favourite Disco records, play a track and tell a story about it. Or not. And sometimes we also have little intimate live concerts. We are happy to welcome you in our cozy place and we hope you will enjoy as much as we do hosting you.